Huzzah, we have a fresh look at Game of Thrones sixth season—and as ever, it both paints a miserable picture for our favorite characters, while also offering a ton of intriguing new teases. Here are the thirteen moments that stand out the most to us, and what they reveal about the new season. As ever with our trailer breakdowns, we’ll be speculating and dealing with some majorly spoilery topics here—so if you’re steering clear of information, this is your warning to turn back before it’s too late. We’ve already seen a bit of context for this thanks to a recent clip shown on Conan, but here we get to see a standoff between Thorne’s supporters in the Night’s Watch and Davos (alongside a few Watchmen still faithful to Jon Snow), standing guard around Jon’s very-dead body. Turns out Davos wasn’t going to attack those men like the first trailer made it seem—they’re stopping Thorne and his men from breaking in and presumably trying to burn Jon’s body so he doesn’t rise as a White Walker. But why, unless Davos has a plan that might see the dead Jon Snow become the very not dead Jon Snow in the near future? 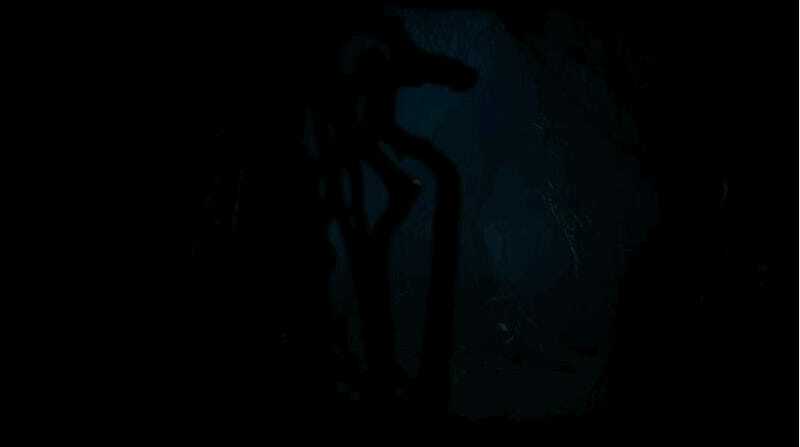 We don’t get to see much of Bran here—or his teacher, the Three-Eyed Raven, now played by Max Von Sydow—but we do get this delightfully creepy shot of him writhing around in the Raven’s tree roots as he experiences his some trauma during one of his warging/vision experiences. We’ve heard a lot about Bran being connected to some major flashbacks this season, like the much-discussed “Tower of Joy” moment (more on that later)—so it looks like his mysterious abilites are getting stronger and stronger. Daenerys gets stripped in a hut by her Dothraki captives—it doesn’t look too good for the former Khaleesi, but not only does the trailer show Drogon will be flying to her aid at some point, but we’ve also heard about set reports that could tie this moment to Daenerys winning over the hordes of the Dothraki once more. 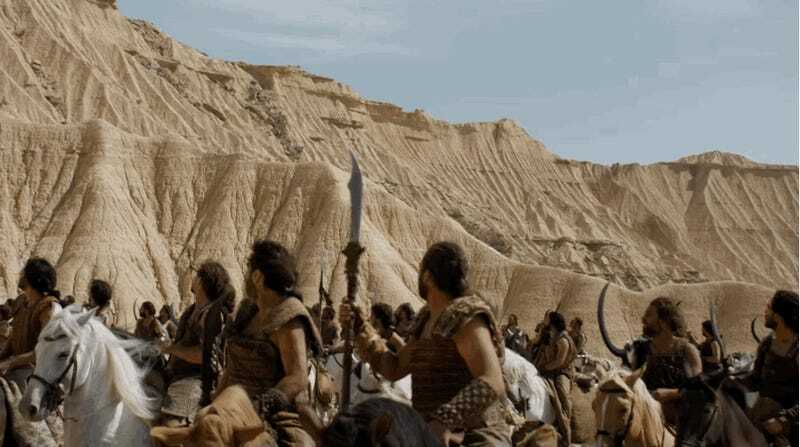 Reportedly scenes shot for the show this year included Daenerys walking naked out of the firey ruins of a huge Dothraki temple—set alight by Drogon—proving that she is the Unburned, the Mother of Dragons, and the myriad other tiles she’s had over the show’s tenure, and inspiring the collected Khalasars at Vaes Dothrak to unite under her banner. Could this be the moments leading up to that? Sansa wants vengeance, judging by her dialogue in the trailer—and we flash back to both Ramsey and the Red Wedding while she demands it. 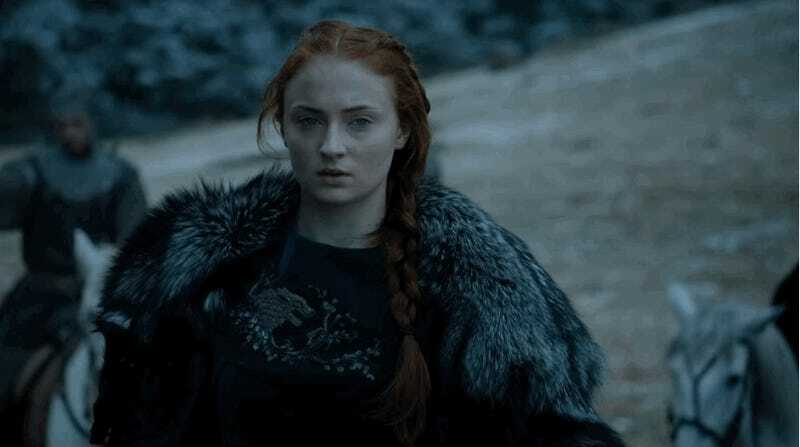 But it’s the shot of Sansa herself that’s the interesting bit: decked out in the direwolf sigil of House Stark, she’s also riding surrounded by soldiers... and this looks an awful lot like the huge battle between Bolton and Northern soldiers that we’ve seen tons of footage from in the past trailer. You know, the one that also involves a revived Jon Snow, wearing Stark colors once more? Sansa’s been rumored to have shot scenes at Saintfield, Northern Ireland, as part of this battle, so it’s not too out of place to imagine her observing it at a distance. We get a brief shot of Margaery and Loras Tyrell embracing in the dungeons of the Sept of Baelor, under arrest by the Sparrows—and Loras is looking in a pretty rough shape (maybe even a fatal shape, giving Finn Jones time to go and become Marvel’s Iron Fist on Netflix?). 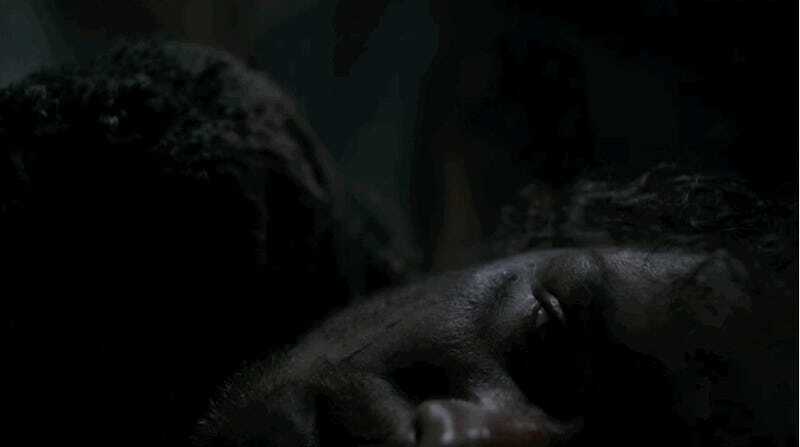 We’ll have more on this later, but it’s possible Loras’ grave condition inspires Margaery to go to the High Sparrow and ask for repentance—and her freedom. We’ve known for a while that we’d be getting another Red Priestess on the show—a while ago, audition tapes for the role of Kinvara (her name may have changed since) included extensive dialogue between her, Varys, and Tyrion in Mereen made their way online. 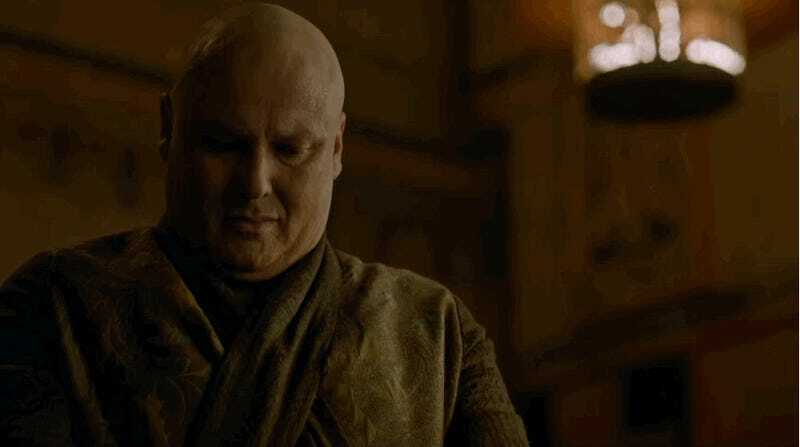 In that scene, Kinvara approached Varys and Tyrion with an offer of aid to get the people of Mereen to support them, and to worship Daenerys as an important warrior in a “Great War” against the Darkness, like Stannis was. Which, as Tyrion then points out to her, didn’t go too well for him. 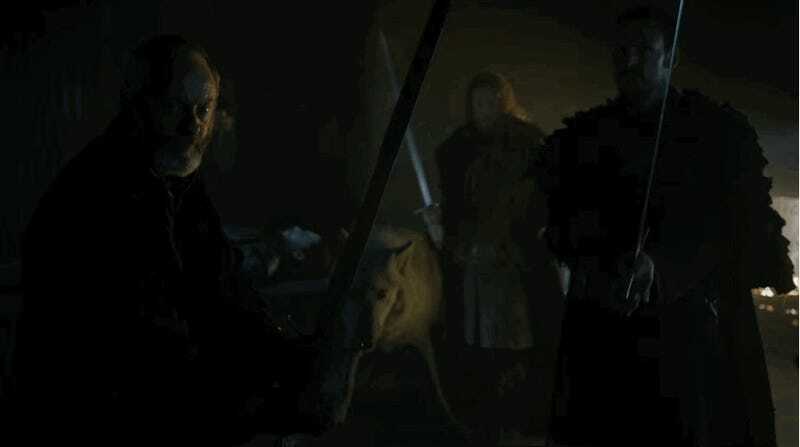 Okay so we don’t learn much about the heavily-discussed flashback to the Tower of Joy—a duel between a young Ned Stark and the Targaryen Kingsguard in the late days of Robert’s Rebellion, which leads to the discovery of his sister Lyanna being found dead—but this shot of a Targaryen knight killing someone is still awesome. The Tower of Joy is important to the long-running fan theory that Lyanna and her captor, Rhaegar Targaryen, are the real parents of Jon Snow: a theory that could be confirmed by this extensive flashback, and an answer we desperately want to see this season. We’d heard rumors that Brienne of Tarth and her squire would be reuniting with Jamie Lannister while he sieged Riverrun in this season, but there’s a few shots in this trailer that confirm it. 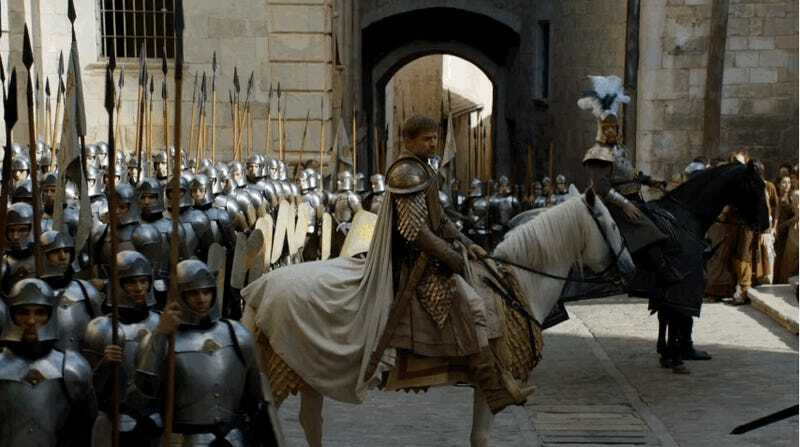 We see scenes of Jaime riding through the Lannister camp, as well as shots of Brienne and Pod there too (note the Tully sigil on the banner behind them), as well as a brief shot of Pod being grabbed by an unknown assailant in the same camp. Cersei’s new bodyguard isn’t in much of this trailer—but we get to see the Frankenstein version of The Mountain in all his fearsome action. 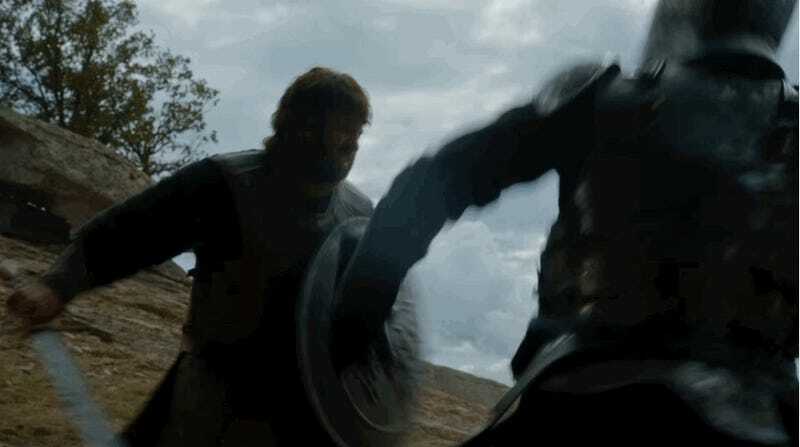 While Cersei espouses that Tommen has to show the Lannister’s enemies who they’re dealing with, we get a the rad shot of Strong being stabbed by someone in a reflective shadow, only for him to turn to his attacker and be totally unharmed. Later on, we cut around a seemingly gruesome shot of Strong yanking the head off a Sparrow—seemingly from that “I Choose Violence” scene from the first trailer. Oh dear. 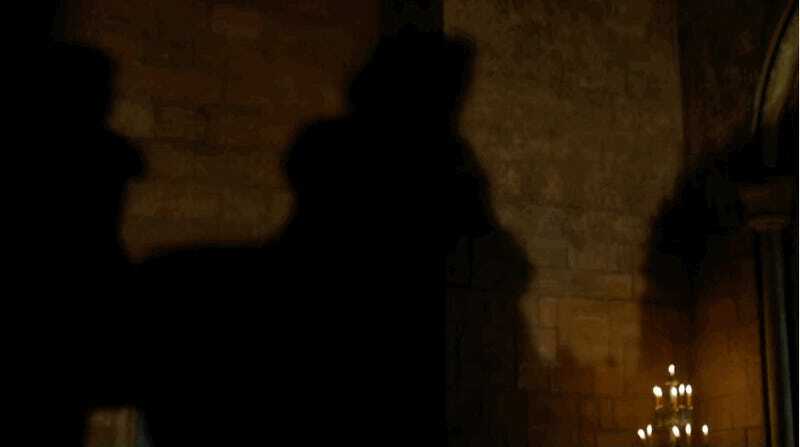 Remember when what we said about Margaery asking for repentance earlier? This scene of Jamie, Mace Tyrell, and a host of Tyrell soldiers storming the Sept of Baelor was in the first trailer as well, but we get a much clearer shot of Jamie and Mace here. Set pictures from filming confirmed that they’re there to free Margaery by force—until the High Sparrow reveals that Margaery is free to go, because she’s converted to the Faith Militant’s teachings. 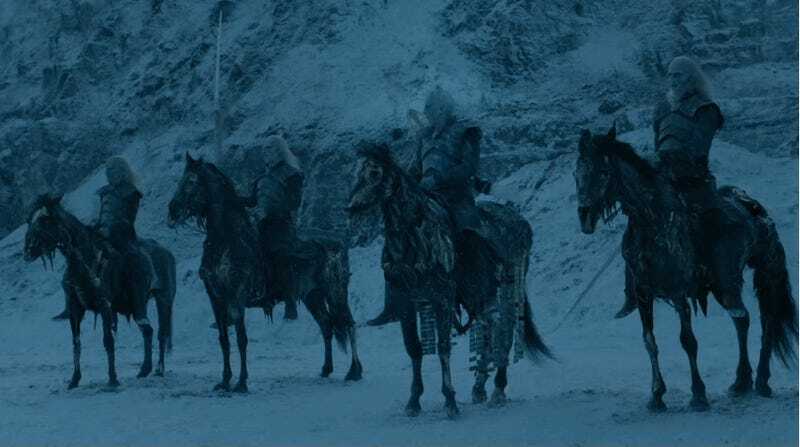 We get even more shots of the terrifying Night’s King—both he and some Walkers on horseback, and then riding through the flames. This could be more from Bran’s vision, as we saw the upright young Stark with the Night’s King at the end of the first trailer for season six. Or it could be an actual White Walker attack! Arya’s given a second—and final—chance at the House of Black and White by Jaqhen, and we get to see her in training with the weird Waif here, getting some fancy staff moves in. In the last trailer, we got shots of Arya on the run from the Waif, something we’d seen in set pictures—presumably this fight comes before that chase. 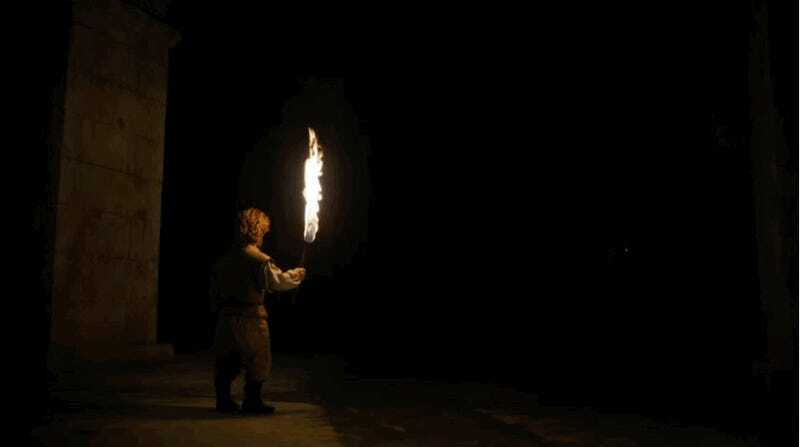 And finally, we get a great money shot of Tyrion going down into the Dungeons below Mereen to see Viseryon and Rhaegal. It’s cut to make it look like Tyrion gets toasted, but hey—that’s probably not going to happen... right? It’s only a few more weeks until we’ll start learning more definite answers about the show’s mysteries—Game of Thrones returns on HBO April 24th.